Constance Wu on the Significance of Crazy Rich Asians: "We Are Putting Possibility on the Screens"
Constance Wu has been nominated for a Golden Globe! It was announced on Thursday morning that the Crazy Rich Asians star is up for Performance by an Actress in a Motion Picture — Musical or Comedy at the January award show. "What a morning to have had my phone on Do Not Disturb Mode till now... I'm ecstatic but also in shock!" Wu tweeted Thursday. "Thank you @goldenglobes !!!" Prior to the release of the film, Wu and her co-stars Henry Golding and Gemma Chan sat down with E! News to talk about the movie and the significance of having an all-Asian cast. "It means the world," Chan told us. "I am just so proud to be a part of this film. This film is not just for Asians, it's for anyone who has ever felt that they struggle to be accepted or they've been otherized. Really it's a celebration." Wu also addressed the open letter she recently shared with her fans on Twitter, in which she quoted the film's director, Jon. M Chu, who says, "This is more than a movie, it's a movement." Talking about the significance of that quote, Wu told E! News it's important to her because it's been "far too long." "And because I know that the only thing that's separating Asian-Americans or Asian-British, anyone who is not the dominant culture who is otherized, is opportunity," Wu shared with us. "And sometimes you don't get opportunity unless you see possibility. So we are putting possibility on the screens out there to show everybody that Asian-American stories are worthy of their own stage, and hopefully we'll hear very many that are different than ours, you know?" 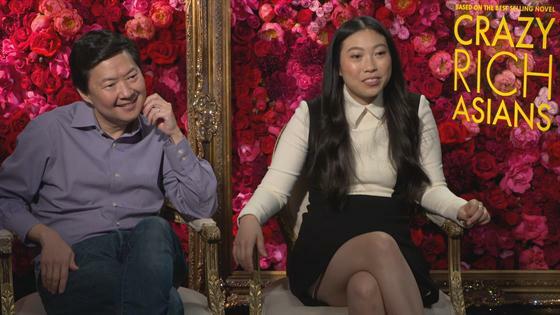 Take a look at what else the cast of Crazy Rich Asians had to say about the movie and its impact in the videos above!